Every bottle has countless stories. There are the stories of how that bottle was made and who made it. What the weather was like and whose hands it went through to reach us. There’s the story of how the bottle came to us, how it tasted on the day we opened it, and how it made us feel. There are the stories of the occasion we opened it for and who we drank it with, or maybe we kept that bottle all to ourselves. Wineries often have chefs create meals for the their wines. Why not do this at home? We figured that the attempt could yield to some interesting results. Let’s pop open a bottle and see where it goes. Let’s give the wine a chance to talk to us. I wanted to start with a bottle with some personal meaning. My husband, Greg, and I just recently moved back to California after five years in New York City. We had a wonderful time in New York, and it was during my time there that I really learned about wine. That said, my pallet started here. This is where I first started going to wineries and tastings and made the first attempts to pay attention to what I was tasting in my glass, so picking a bottle from CA seemed like a good way to celebrate the return. 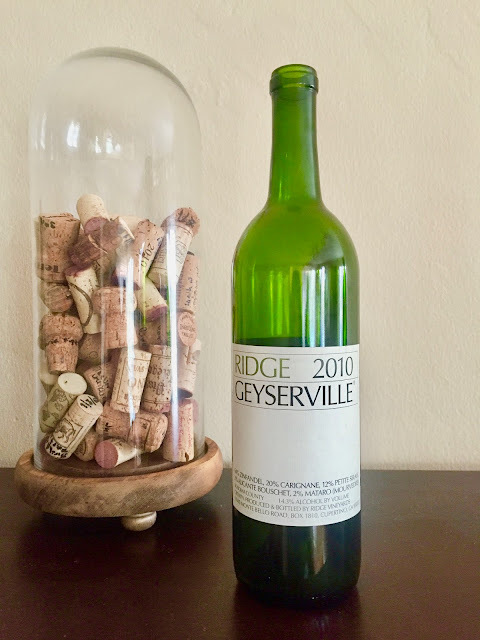 Ridge Vineyards was a favorite of ours from way back when. Their Lytton Springs location was an early stop in our wine tasting journeys, and it was one of the first places we returned to when we got back. (We have yet to make it to the Monte Bello location, but hope to soon.) 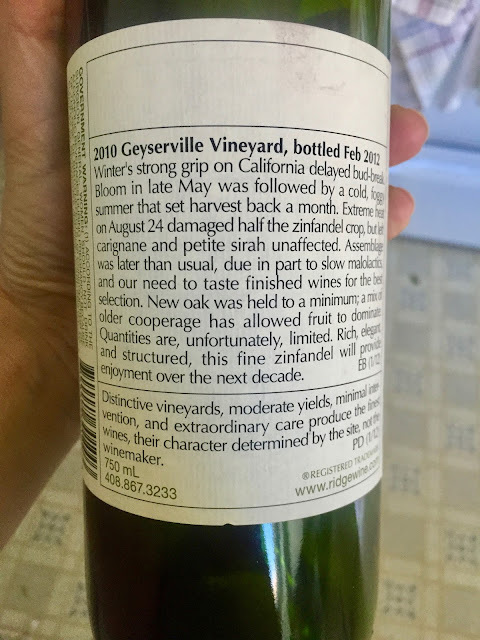 This particular bottle of their Geyserville also happened to be from the year we left for NYC, 2010. When we popped it open, we got hints of smoke and plums on the nose, a bit of raspberry preserves, licorice, spice, and light notes of forest floor. More savory notes joined in on the palate, with black pepper, tobacco, and hints of flint and baked clay. The fruit was also a little brighter than it had seemed on the nose, with some tart cherries joining the party. Tannins were noticeable, but silky. There was a bit of jamminess to the wine, but it was held up by the acid, and overall it wasn’t at all overbearing in its weight and mouthfeel. We decanted the wine and it grew evermore integrated and elegant over the several hours that passed before we sat down to dinner. By that point the wine had unwound and there was a gracefulness balancing the fruit, like a curvy gal who moves with the litheness of a dancer. This is a quality I tend to find and appreciate in their wines in general–ripe fruit that is distinctly California, but with a sleek thread running through the core. This is a a tricky tightrope to walk, particularly with Zin, which makes up 64% of this blend. I’m sure this wine will continue to be lovely for several more years. A big steak didn’t seem quite right. I don’t think it would have been a mismatch at all, but that lithe quality seemed more in line with a mid-weight protein. My thoughts turned to pork and turkey, possibly duck. That said, there were still some big flavors in the wine with its smokiness and long raspberry jam finish, so I thought it would be able to handle some more robust seasonings or sauce. I headed to the store with my tasting and brainstorm notes and came back with pork chops to be flavored with Bourbon to echo the notes of smoke and spice. A hearty side seemed in order and I thought the slightly nutty flavor of farro would work well. I added in yellow squash as I thought it would add substance, but was also mild enough to play well with the other flavors. If I do say so myself, the results of round one of this experiment were quite successful! The smoke and spice notes in each definitely came out, but the wine remained refreshing without weighing the food down or vice versa. The wine and the food melded and danced seamlessly together. Exactly the type of match I was hoping for. The full blend for this wine is 64% Zinfandel, 20% Carignane, 12% Petite Sirah, 2% Alicante Bouschet, 2% Mataro (Mourvèdre). New oak was kept to a minimum (10% new, 12% one and two years old, 78% three to four years old. 100%) so a good chunk of the spice that was coming through had to be from the fruit itself. Ridge takes a non-interventionist approach to winemaking (they call it “pre-industrial”) and use all native yeasts in their fermentations. Ridge actually puts a lot of their wines’ details right on their bottles, including ‘drink by’ recommendations, which can be really helpful. 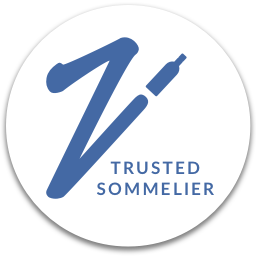 If you want to dive deeper into the details, their website is one of the more informative I’ve seen–providing even specifics on winemaking additives like sulfur. They also have a big section dedicated to food pairings with many delicious looking recipes, if you’re looking for further inspiration. You can find the tech sheet for this wine right here. WineSearcher.com currently has the average price for this wine at $45, with prices starting at around $35, making it an attainable indulgence. Something about the mixture of ripe fruit with spice and smoke balanced by acid had us thinking that Rioja Reserva might be a good alternate match for this dish. A Grenache based wine of moderate weight might be another good route to take. Please share any alternate matches that work for you. I’ve separated the two recipes below to make it simpler to make them on their own– I really like them independently as well as together. If you decide to make them together, set the pork chops to marinade, get your farro going, then proceed to do all of your other prep. You can then make the entire farro salad, but hold off on adding the arugula. Set the farro salad aside and keep it warm while you make the pork chops. Wilt the arugula into the warm salad just before serving. 1. Mix together the chili powder, allspice, salt and pepper. Rub the mix into the pork chops and place into a bowl. Add the Worcestershire sauce and allow pork chops to marinate for at least 20 minutes. Note: You’ll want the pork chops to be at room temperature when you start cooking. If you marinate far in advance and decide to return the pork chops to the fridge, make sure to pull them out with enough time to come back up to temp–at least 30 minutes. 2. When you’re ready to start cooking the pork chop, remove them from the marinade and pat dry. Reserve the marinade. Heat a small amount of oil in a large pan over medium-high heat until the oil is shimmering. Add the pork chops to the pan, reduce the heat to medium, and sear for about 5 minutes or until golden brown. Flip the pork chops and cook on the second side until an internal read thermometer hits between 135°-140°F for medium rare chops–approximately another 4-5 minutes. Remove the chops to a separate platter or cutting board and rest for 7-10 minutes. 3. Make the sauce while the pork chops rest. Remove excess oil from the pan, then deglaze the pan with a little bit of the stock. Add the bourbon followed by the rest of the stock. Add about a ⅛ cup of the marinade to start. Bring the mixture to a boil then reduce to a simmer. Once the sauce has been reduced a bit, taste and adjust seasoning. You might also choose to add more of the marinade mixture at this point, however, since the Worcestershire-chili flavor is strong, this should be added gradually to suit taste. (If you add more, make sure to bring the sauce back up to a boil before serving.) Reduce the sauce to the consistency of a light glaze. Note: The amount of liquid needed might vary depending on the size of your pan, as liquid will cook off more quickly in a large, flat skillet. Adjust as needed. 4. When you’re ready to serve, turn off the heat then add the butter to the pan and swirl to melt. Return the pork chops to the pan and briefly run through the sauce on both sides to coat. 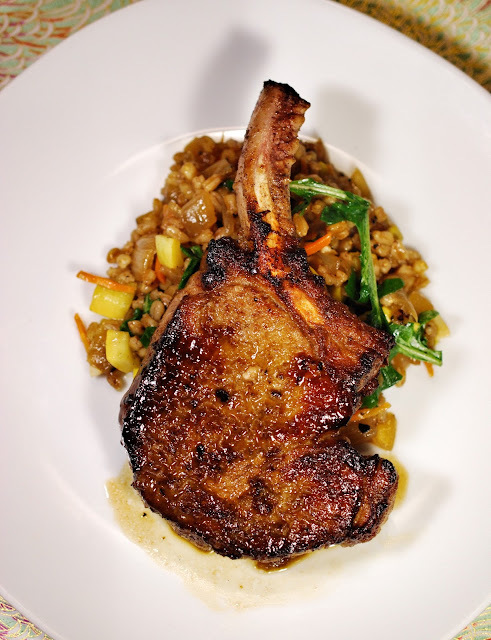 Serve each chop with a small amount of the sauce on a mound of the farro salad. 1. Add a small amount of oil to a large pot, then add the farro, along with a generous pinch of salt, and toss it all well to combine. Heat gently over medium-low to medium heat and allow the farro to warm and toast slightly until it starts to smell lightly nutty–this should just take a couple of minutes. Add the liquid to the pot and bring to a boil, then reduce to simmer and cook for 30-40 minutes, until all of the liquid has been absorbed and the grains are tender. Cover and set aside for a few minutes before fluffing. Notes on farro: Start checking on the farro at around 20 minutes for consistency. Soaking farro ahead of time can reduce cooking time a bit, but it cooks pretty quickly even if you skip it. If you soaked the farro ahead of time, 20 min might be all it takes. A lot of recipes and package instructions for farro call for 3 cups of liquid to one cup of grains, but then also state that excess liquid should be drained off. I found that by reducing the amount to 2 ½ cups, all the liquid absorbed without having to drain it off and the farro cooked through completely. Add more if you check on the farro and find that it’s not fully tender, or drain off excess if there is still a bit left once the farro is tender and toothsome. 2. Prepare the vegetables while the farro is cooking. Heat a small amount of olive oil in a large sauté pan over medium to medium-high heat. Add the onions with a generous pinch of salt and sauté until lightly golden and starting caramelize (about 10-15 minutes), stirring frequently. You want to develop the color on the onions gradually without burning them, so if needed, periodically add a little bit of water to slow the cooking down. This also helps to deglaze the pan as you go. 3. Once the onions are soft and lightly golden, add the squash and the garlic, and continue cooking until the squash is beginning to soften–about 8 minutes. Then add the shredded carrots and cook for another couple of minutes until all of the vegetables are tender. Taste and season with salt and pepper. Remove from heat. 4. Fluff the farro once it has had a few minutes to rest. You can then combine the farro and the vegetables and toss gently. Set aside and keep warm. When you’re ready to serve, add the arugula to the warm salad and toss to gently wilt the arugula. Taste again, adjust seasoning, and serve. Looks great! A favorite pork pairing for me is a white Rhone, like a St. Joseph Blanc. I think pork is one of those meats that can go with either white or red wine, and I think the St. Joseph would do just fine with the sauce and grill treatment. The other thought comes from a chance pairing success I had last summer: Oloroso Sherry, definitely give it a try!